An identical vase is in the National Palace Museum, Taiwan, illustrated in Enamel Ware in the Ming and Ch'ing Dynasties, Taiwan, 1999, pl. 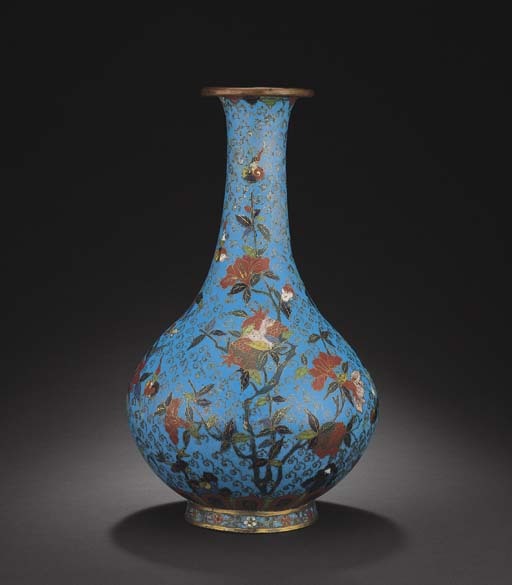 9; another example was sold in our London Rooms, 10 December 1990, lot 281; and a related vase is illustrated by Pierre Uldry, Chinesisches Cloisonne, Zurich, 1985, p. 138. The 'Three Abundances' theme was a popular one in the decorative arts because of their auspicious meanings - the peach represents longevity, the pomegranate, fertility and abundance, and the finger citron symbolises riches.